There’s no need to shell out the big bucks for your next painting project. Instead, try one of these five recipes to mix up your own paint—and the perfect color—from scratch. The next time you’re faced with a painting project, don’t head to the hardware store straight away. Whether you’re coloring a piece of furniture or an exterior wall, there are plenty of homemade options available for you to consider—many of them cheaper than store-bought counterparts and chemical-free. But that’s not all: Mixing up your own homemade paint offers more control over the finish so you end up with one that’s more in tune with your décor needs. Check out five varieties you can craft to brush up your DIY game. 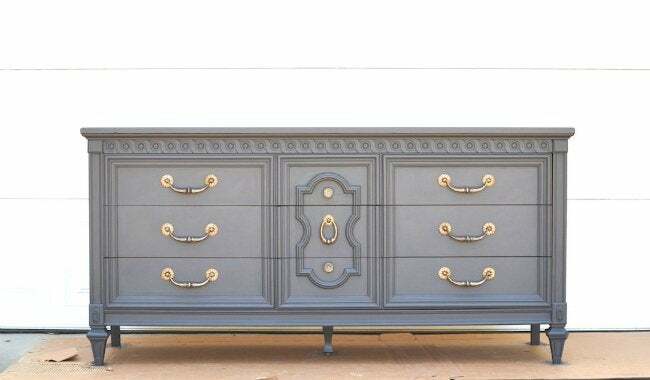 If you want to achieve an easy-to-distress matte finish and you like the sound of less work—no primer or sanding required before your first coat of paint—check out chalk paint. 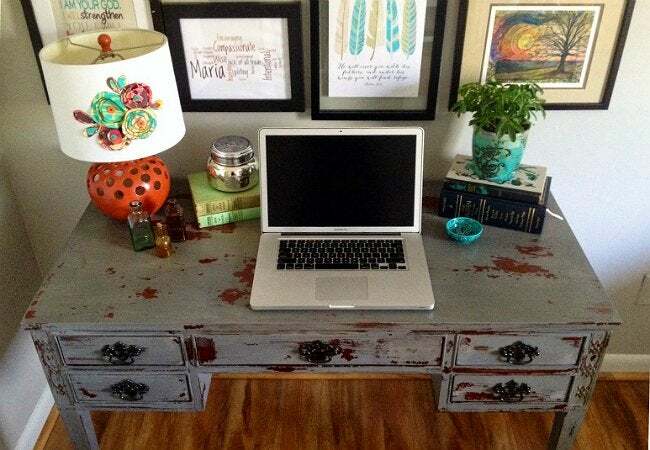 It’s slight grit and forgiving texture make it a prime candidate for painting wood pieces in a distressed style. To make your own, simply stir up 1/3 cup of Plaster of Paris in 1/3 cup of cool water until it’s completely smooth. Then mix that solution with 1 cup of flat latex paint. Keep in mind that you shouldn’t store and reuse chalk paint, so, depending on the project, adjust the amount you mix up accordingly and use it as soon as it’s ready. Not to be confused with chalk paint, chalkboard paint turns any old wall into a fun way to jot reminders to self and notes for family or guests—an especially trendy upgrade in the kitchen or entryway. No need to limit yourself to black here! This recipe works for any color of your choosing. To mix up your own paint, fill a plastic bucket with a ratio of 2 tablespoons non-sanded tile grout to every cup of flat-finish latex or acrylic craft paint, depending on the scope of the project. (You might choose the latex for a wall but mix up a smaller batch with acrylic to paint on smaller housewares like the inside of a medicine cabinet, for example.) Mix thoroughly to remove any and all clumps. Apply with a roller or paint brush in a nice, even coat, then—after it dries—smooth the entire wall with a fine sandpaper and wipe away the dust with a slightly damp cloth. Start by squeezing a lemon or lime to get 1/2 cup of juice, and mix that with a quart of skim milk in a pot to curdle overnight. (For larger projects, you can increase the quantity following the same ratio.) The next day, pour the liquid through the sieve lined with cheesecloth in order to fully separate out the curds from the whey. Rinse off the curds in water to keep them moist, toss them into a mixing bowl. Sprinkle in dry color pigment, which can be found online or at an art supply store, until you get your desired hue; stir all together. Apply immediately to your wood, leaving it no time to spoil, and paint on an extra coat than you think is necessary—it’s sure to dry lighter than you expect. 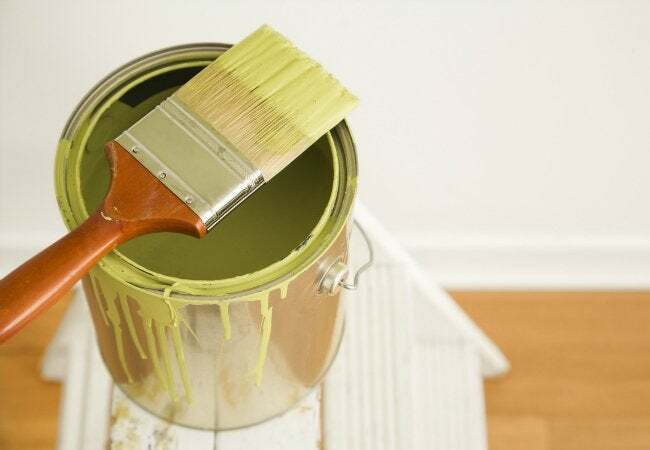 Don’t worry about any lingering odor while you work: That will go away as soon as the paint dries. 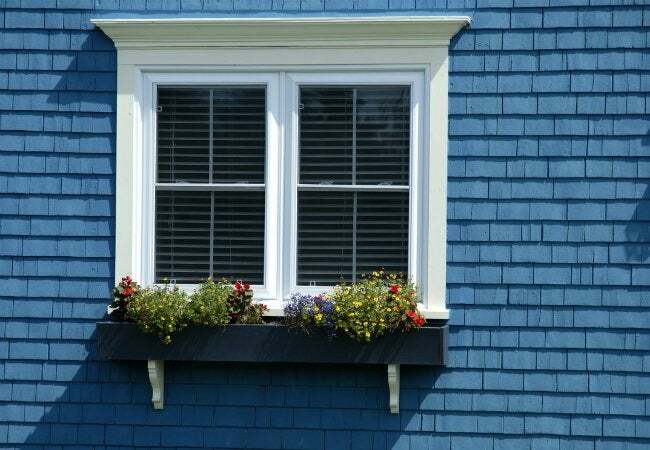 Best for giving a matte finish to exterior walls, this easy-to-make paint is not only cheap—it’s non-toxic. Ready a batch sizable enough for your outdoor project by starting 7 quarts of water over high heat on the stovetop; while waiting for the pot to come to a boil, combine 23 ounces of white flour with 1-1/2 quarts of cold water in a separate bowl. Then pour in each of the next ingredients in the following order, with 15 minutes of stirring and cooking between additions: first the flour-water mixture, then your coloring pigments and 9 ounces of iron sulfate, and lastly 1 quart of linseed oil. Pull the large pot off of your heat and stir in about 3-1/2 ounces of (colorless) dishwashing soap while it cools. When the paint is cool to the touch, you’re good to get to work with the rest of your DIY paint job. As you may have experienced with prior house-painting or furniture-painting jobs, regular paint easily adheres to clothing and its hard, impermeable finish withstands many washes. That’s all well and good, but occasionally you may be interested in intentionally adding a paint-on design or coloring over old upholstery without leaving your fabric stiff. 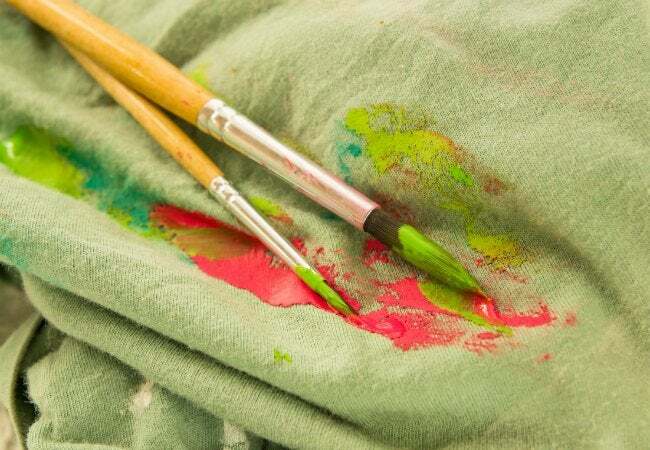 To create your own flexible fabric paint, simply mix the acrylic paint of your choice with an acrylic medium (also found at most craft stores) in equal parts. A medium thins your acrylic so that it goes on your fabric with a softer, more malleable texture. Apply to your heart’s content. Then, 24 hours after it dries, help your design survive future machine washing by heat-setting the fabric paint—swiping a dry iron on medium heat back and forth over the paint for three minutes should do the trick.